The Gap: A Shortage of Affordable Homes, a new report released today by the National Low Income Housing Coalition (NLIHC) and Housing Action Illinois, finds a severe shortage of affordable rental homes for the extremely low-income (ELI) renter households across the nation, including Illinois. In Illinois, 88 percent of ELI renters are considered cost-burdened, as they pay more than 30 percent of their income on housing costs and utilities. Seventy-two percent of ELI renters are severely cost-burdened, as they pay more than half of their income on housing costs and utilities. 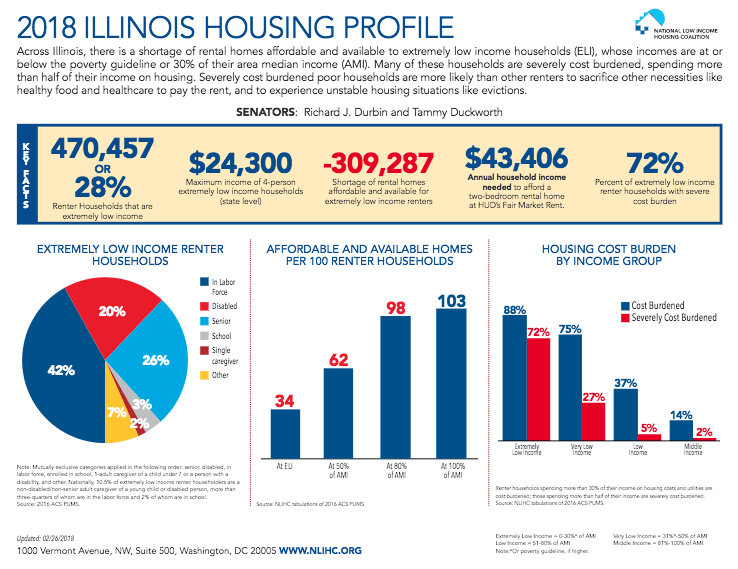 With only 34 affordable and available rental homes per 100 ELI renters in Illinois, the total shortage of rental homes affordable and available for these households is 309,287. The report comes out at a time when Congress is working to finalize the federal budget for the current fiscal year, FY18, by March 23, when the current Continuing Resolution expires. “We ask that Congress provide the highest possible funding level for seniors, people with disabilities, and families with children who struggle to pay the rent and make ends meet,” said Bob Palmer, Policy Director for Housing Action Illinois. Federal programs that are of specific concern include public housing, homeless assistance, and housing vouchers. ELI households have incomes at or below 30% of their area median income or the poverty guideline, whichever is higher. Based on the poverty guideline, ELI households in Illinois are families of four that earn $25,100 or less annually, or a single adult that earns $12,140 or less annually. Nationally, the report finds a shortage of 7.2 million affordable and available rental homes for ELI renter households. The study finds there are just 35 affordable and available units for every 100 ELI renter households nationwide and that 71% of ELI renter households are severely housing cost-burdened, spending more than half of their income on housing. View the report online here and the Illinois state profile here. About 12 hours ago from Housing Action IL's Twitter via Hootsuite Inc.